FireProtect is the fire safety barrier of the Ajax system. 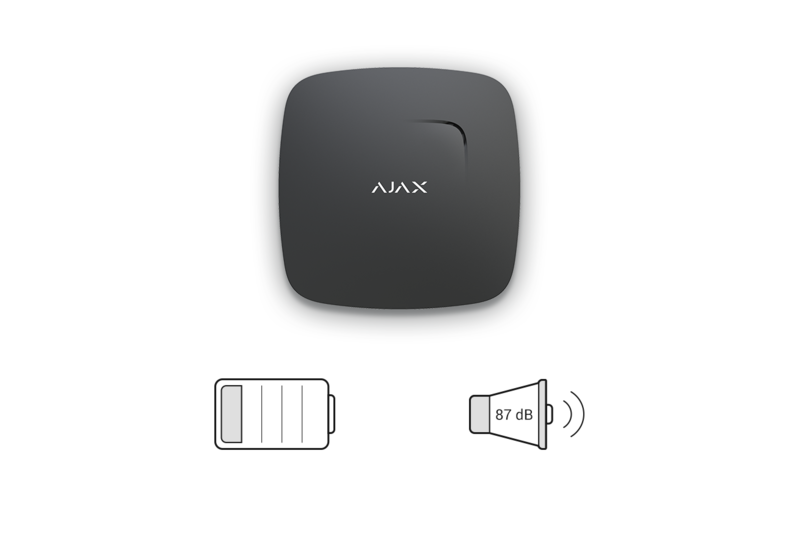 It can connect to the Ajax Hub or work independently— just turn it on and hang it under the ceiling to get round the clock protection. It detects both smoke and sudden temperature increases. 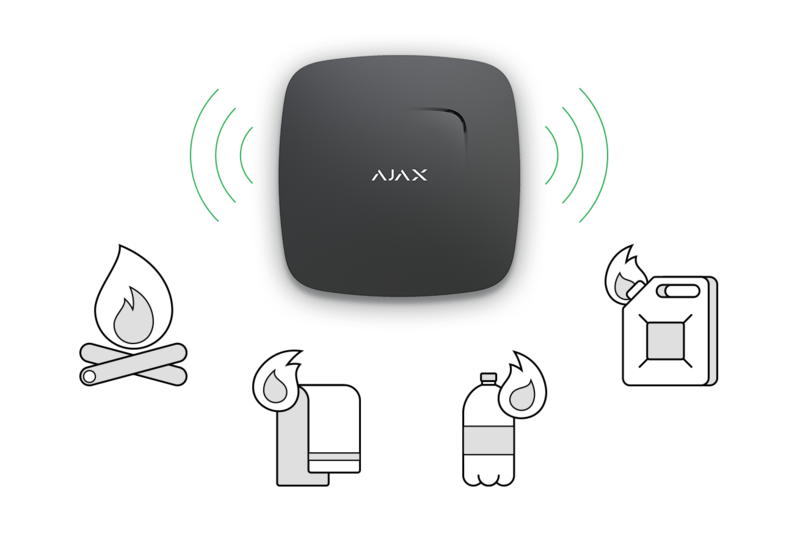 The device allows you to configure different types of alarm and can work in unison with other Ajax fire detectors — if just one detects a fire, all the sirens will turn on. FireProtect is wireless and self-powered. 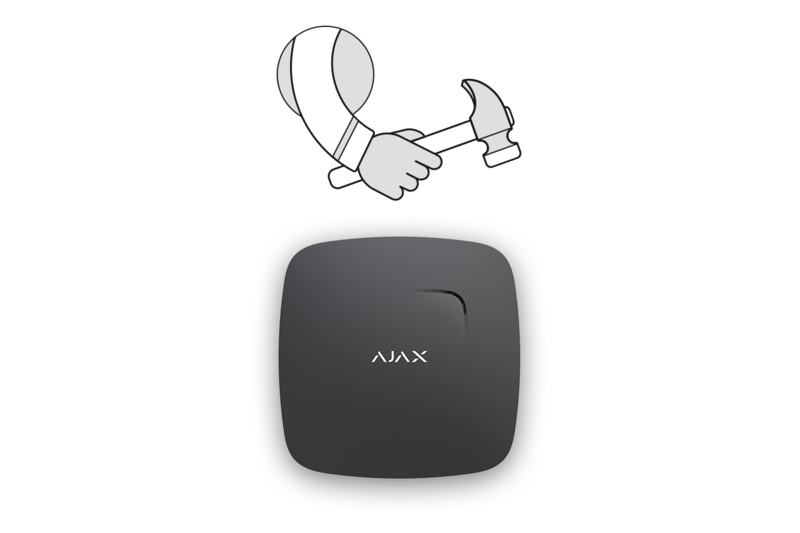 Using the Ajax mobile application, you can monitor the device status, adjust the settings or even test the smoke chamber (yes, there’s no more need to climb up to the ceiling and try to press that tiny button). And all off this can be done from anywhere in the world. In order to enter the world fire safety market and to compete with other professional solutions, FireProtect had to earn certification from an independent laboratory for compliance with certain industry standards. If the device could manage to pass all the tests, then there would be no doubts about its quality and reliability. So we sent 20 FireProtect detectors to an independent lab. Here’s what they had to survive in order to be awarded EN 14604 certification. Every fire is unique. The rate of temperature increase depends on the materials in the room, as well as the conditions there. The smoke can be billowing, or there can be practically none. It can vary in density and transparency. But, nevertheless, a fire detector needs to raise the alarm in time. And you need to be able trust that it will. The laboratory checked whether the detector is able to react to smoke over and over again, whether it loses effectiveness after its first alarm. Technicians placed FireProtect in a smoke channel — a stand with a controlled smoke flow — and delivered smoke six times in a row. Then things got interesting. They began to change the position of the device in order to determine whether it could detect smoke from all sides. Once it became evident that FireProtect was in accordance with the standards, it was on to the fires. A fire detector needs to react to different types of smoke with different physical properties. To verify that ours does, four FireProtect detectors were placed in a test fire room, where wood, cotton, plastic (polyurethane) and liquid (n-heptane) were burned alternatively. Once it managed to raise all the alarms in time, the testing continued. Determining a fire in time is a top priority, but it’s also important that FireProtect doesn’t make mistakes under adverse conditions. After working around the clock for years on end, detectors can experience temperature changes, including heat and bitter cold. It can be exposed to drafts and blinding sunlight. So the next battery of tests determined its ability to resist the elements. FireProtect had already proven its ability to detect smoke under optimal conditions, so researchers changed the situation: they simulated gusts and drafts. They raised the room temperature to 55°C and cooled it down to 0°C. They combined heat with high humidity (40°C at 90% humidity). They shined bright lamps on the device. The detector was checked at each extreme to see whether there would be any false positives, whether it would react to smoke in time and whether its normal operation would be disrupted. Once these tests were passed, there were no doubts remaining about the detector’s ability to withstand changing conditions— and false alarms aren’t a worry either. There’s no use in relying on a fire detection device that fails when it’s dropped or hit. Or when it deals with vibration, electrostatic or electromagnetic fields. Of course, within the context of possible real-life scenarios (as opposed to someone actively trying to destroy the detector at any cost). Experts tested the impact resistance of FireProtect with a moving hammer: one strike has the force of 1.9 joules. Only it’s in the (potentially) weakest spot. And once everything checked out, it was on to the vibration stand, electrostatic impact and electromagnetic field tests. If the device is powered by batteries, it must warn users in advance when batteries are low and need to be replaced. The EN 14604 standard requires audible warnings one month before the batteries are completely depleted and at least a year of detector operation, taking into account routine testing (our FireProtect lasts up to 4 years). And the device should monitor the status of the backup battery at all times, alerting users if there’s a problem. If there’s a fire, everyone needs to know: people in the next room, deep sleepers and those hard of hearing. For that reason, the siren may not have a sound level below 85 dB at a distance of 3 meters. Once experts have measured the loudness, they check whether the buzzer is able to work continuously for a long period of time— 8 hours, alternating between 5 minutes of sound and 5 minutes of rest. 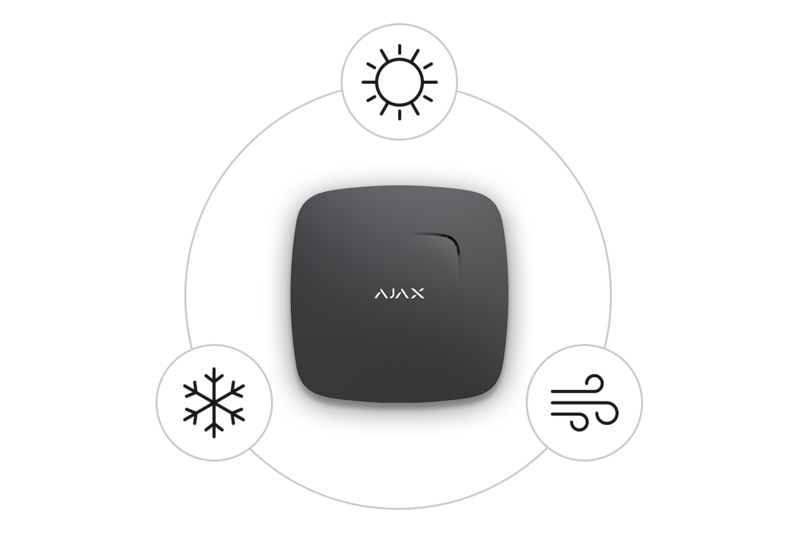 It’s worth noting that FireProtect, in addition to using its built-in buzzer, can alert users to a fire using other Ajax sirens installed in the premises, as well as via calls, SMS and push notifications— something that’s not required, but we think is essential. In order to get certified, the fire safety device must successfully overcome each test— react to smoke in time, withstand the trial, maintain its operating efficiency. And 20 different devices have to go through these “nine circles of hell,” which means you can’t pass on luck. 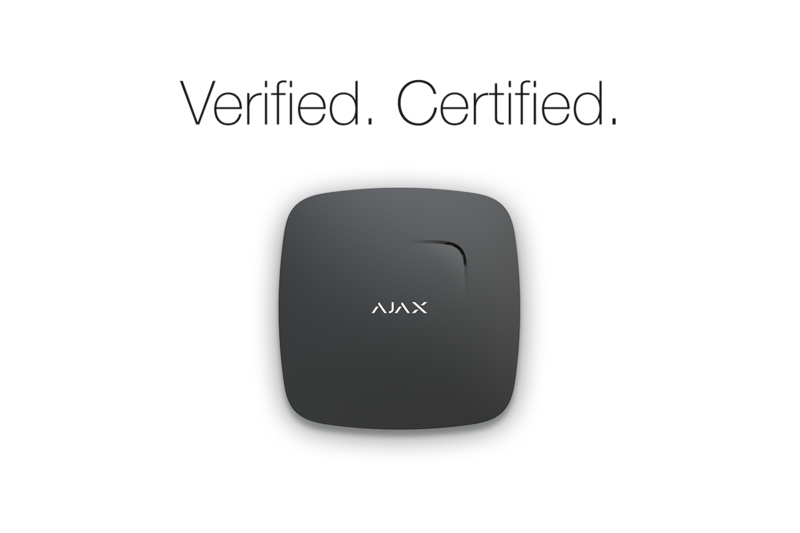 By earning EN 14604 certification, Ajax FireProtect has proven that it is reliable and that it can be entrusted to protect both property and people.